If you’re looking to dress up your Tesla Model 3, Model X, or Model S with a new set of beautiful rims, look no further than our Tesla PVD chrome wheels at Wheel Creations PVD. We have a variety of finishes to ensure that you get a perfect and personalized look for your electric car. Want to upgrade your factory-finished or aftermarket wheels to new custom wheels that are lighter, last much longer, and ideal for all weather conditions? We’re here to help you. With our revolutionary O.E.M. wheel exchange program, you don’t have to worry about spending more money to buy new wheels. Our program allows you to get high quality Tesla PVD chrome wheels in exchange for your factory finished wheels. We exchange like-for-like wheels, meaning that we deliver the same-style wheels you have on your Tesla in your preferred chrome finish at a fraction of the cost. 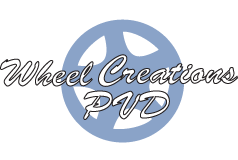 Want to learn more about our PVD chrome process, PVD chrome finishes, wheel exchange program, or other services like wheel restoration and wheel refinishing? With our PVD chrome process, you no longer have to worry about wheel pitting, peeling, curb rash, or corrosion. Our Tesla PVD chrome wheels far outlast your factory finished wheels and come with a 4-year warranty. Contact us to learn more.